Hi! I’m glad you accepted the invitation to do this interview. Can you please start by telling us a bit about yourselves? Yaniv: I’m 32 years old and living in Israel. My days usually revolve mainly around music - composing, producing, and practicing the piano, also I do a lot of mastering work in the mastering studio I run and of course I also do some “office” work running Aleph Zero along with my partner Shahar. Omi: Hi, my name is Omri Harpaz I live in Hertzeliya Israel. I am involved in 2 major projects one is Shulman and the other is 40%. Also I own a booking agency called Absolute Booking. You’re on the musical road for a long time, and this road can lead to many different places, so how do you choose where you want to go? Yaniv: I’ve always been into music as a listener and when I grew up, also as a musical experimentalist trying and experimenting with different instruments. When I discovered the electronic music world I realized that because of the extremely flexible sonic capabilities offered by the new synthesizers and software, a new world of possibilities and a new dimension of musical creation has been opened for exploration. I was fascinated with this music and decided to try and experiment in this field. At first I did some trance music because it was easy enough to begin with, but I got bored of it quite quickly. I then decided to try a more freestyle approach to music and just make music without any restrictions (having to make people dance is a restriction!). I don’t really define my music under “Ambient” or any other genre and I think it’s pretty much different than anything else, really. In the last two years I’ve been studying music in a more profound and serious way and I find myself listening more and more to traditional and modern classic and jazz music. At the moment I’m looking for new ways to incorporate my new knowledge and musical aspirations into the electronic music genre. I believe it will include the piano, string instruments and more acoustic instrumnets which I find more and more interesting to combine with the electronic music. Omi: Since my early childhood years I was fascinated with music. I always had a drive to explore all sorts of musical genres and domains. I journeyed through heavy metal, punk, new age and garage. When I was around 15 I discovered electronic music, and was immediately hooked. Then I found trance and became a DJ and later started to produce as well. But after a while, trance was not interesting enough just in itself, I guess. So we experiment and flow in new directions. It's a great adventure. Do you have the listeners in mind when writing new tracks or just follow your feelings? We just follow our own musical vision and sense of aesthetics and aim to do the best music we can in our eyes. We think that since we don’t feel bound by any genre restrictions it gives us enough freedom degrees to go our own musical way. What’s your favorite activity when not working on music? Yaniv: Studying music and playing the piano, listening to music, sports (yoga, swimming, and bicycle), watching movies, a little hiking and reading if I have some extra time, and of course I spend my free time with my girlfriend, friends and family. Omi: Movies, TV, beach, reading, addicted to the net, drinking, any fun activity is always welcomed. I understand that your new album, Endless Rhythms of the Beatless Heart, took 4 years to be ready. Why did it take so long? You were continuously working on each track during this 4 years period or some of the tracks were already ready for some time? We don’t really know why it took so long. We guess that we didn’t want to release it before we were 100% happy with it. Of course that during this time we did many other things in our lives. We did not sit for 4 years in the studio and work on this album all day. For example, the opening track on the album -“Retroscape” is actually the first track composed after “In Search of a Meaningful Moment” was completed. In fact, we think Retroscape’s first version was completed before “In Search of a Meaningful Moment” was released! But this track was edited from time to time and we think it turned out to be one of the last tracks to finish on the album! With that said not all of the tracks were edited repeatedly, some were just left as they were originally written. To be honest we don’t really care how long it took to produce, much more important to us is the quality of the music and the story it tells. Why did you release Random Thoughts in the middle? Random Thoughts was released to give stage to different works that accumulated over time. Some of the tracks were remixes and some were collaborations with other artists, and more importantly they are very varied in style and feel. We think that this sort of an artist compilation/album concept is the best platform to present these works and share them with our fans. How did the use of acoustic musicians for the album affected the music and the creative process? Working with other good musicians is always very inspiring and adds to the creative process. There is no doubt that each of the participating musicians contributed a great deal in making “Endless Rhythms of the Beatless Heart” what it is. In fact, some of the tracks were rearranged a few times to reflect new ideas and suggestions made by them. We would like to thank everyone that was involved in this album, and especially our warmest thanks to Danny Shnaiderman, Yonatan Raviv, Yakir Ben-Tov, Yonatan Galila and Amir Gvirtzman for their amazing contribution, support and wonderful ideas. Usually the work flow begins when we have an idea for a theme or a rough sketch which we would like to develop. Then we go into the studio to a recording session in which we try different ideas and improvisations on the theme. After the initial session we sit in the studio and edit the recording to form a finer draft of the track. Then we go back into the studio to record corrections and additions if needed. So we guess the process is some sort of incremental loop in which every phase the music is changed until we are satisfied with the result. The use of ethnic musicians from different music systems - Middle Eastern, Indian - how does it affect the music? How do you, as western musicians, deal with this. To be completely honest we don’t have any real musical education in Middle Eastern or Indian music. Our entire knowledge of these musical systems was gathered from listening to this music which we enjoy immensely! We think that the Middle Eastern and Indian themes have a considerable effect on our music and it paints it in a very magical color. Because as we said we don’t have any real musical education in these systems we just do whatever it is we find pleasing. So I guess that the final outcome is some sort of a weird fusion of styles. I heard a lot about your new live show- what's the difference between a show with a band and a laptop Live show. Did the new live show affect your music creation? Our live show is really special because it is a unique combination of electronic sequencers and acoustic instruments. At the moment it includes two computers, drums, electric bass, keyboards, electric guitar, and hopefully in the near future we will be joined by a wind player. We just had a gig over at T.A.Z. Festival in Israel which was really fun. Those who are interested can watch a video clip of the live show here: Shulman Video or download a live recording from our website www.shulman.info . The only problem with this setup is that the costs of flying and hosting five people are too expensive for most promoters outside of Israel. I really hope that the whole band will get a chance to play in a big festival over the world, I’m sure people will enjoy it immensely. Because of that when we’re invited to events outside of Israel, we usually play a “live” laptop set since it usually involved in flying just one or two people. Our next shows are currently scheduled for Christmas evening and New Years evening at Melbourne Australia. The live show has affected our music creation in two major aspects. First, we work a lot in rehearsals with the players which gives us more experience working with acoustic instruments. Second, the shows inspired us to edit the featured tunes in a more upbeat and groovy way especially for the shows. Did working with other musicians and using different musical instruments along with synths and electronic tools changed your perception on the electronic aspect of the music? Yes, working with other musicians has certainly changed our perception and our music. We really enjoy working with other people and we believe that the cross feedback from other people who are actively involved in the process of composing and arranging the music takes the music into a far better and mature places. With that said, both the electronic equipment and human beings have their own respective and respected places in the process of music creation and we think that the combination of both worlds covers the most out of what is possible today in the world of music. Our experiences have not caused us to favor one thing over the other... only to acknowledge and understand the differences between the two and to elevate the advantages and use each of both worlds where is appropriate to achieve the best possible musical results. What do you think about the cover of the “Endless Rhythms of the Beatless Heart”? Yes we think it’s excellent. We rather not delve into our interpretation of the work not to interfere with other people’s impressions, thoughts and the way they connect it to the music. We feel this should be left a subjective experience. People are waiting for another "In Search of a meaningful moment", having high expectations from you. How do you see it? How is this album different from that one? We think that “Endless Rhythms of the Beatless Heart” is in some ways an improved, more mature continuation of “In Search of a Meaningful Moment”. However this album stands out strongly on its own, being a whole, complete and unique creation with its own colors and sonic images. What do you think about the album? It is by far our favorite album of all four so far, and we feel it shows a major musical improvment and that we took a significant step forward in our compositional, arranging and prduction skills. We feel that this album is truly unique and that we did managed to break the mold. It’s the first album we are totaly proud of! For sound clips from the new album please check out this amazing e-flyer created by the most talented Phillip (Agalactia): e-flyer . You’re one of the owners of Aleph Zero Records. How do you choose the music you will release? How is it to work with your partner, DJ Shahar? 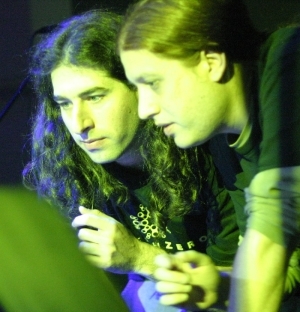 Yaniv: Aleph Zero was initially created to release only my music. It happened as a direct consequence of the horrible experience I had with the label which released my debut album, “Soundscapes and Modern Tales”, Shaffel Records. They lied to me relentlessly about everything. And did absolutely nothing but hurt my release in every possible way they could. The most important thing for me is honesty, and since I was so hurt and didn't know who I can trust in this business, I decided that I'm not taking any more chances with other labels, and with that notion Aleph Zero was born. After a short while I had a chat with Shahar Bar Yitzhak A.K.A. DJ Shahar (the founder of isratrance.com) and we decided that he will join me and we will develop Aleph Zero as a label that puts honesty, integrity, and professionalism at the top of the list. Shahar is an amazing person and a good friend and these days he finalizes his master degree in Indian culture studies. Also, I have great respect for him on the business side of things, since he is a very honest guy (even if it doesn’t always serve him good) and we seem to share a lot of high standards of working and approach towards doing things. I’m sure that every artist or business that ever worked with us will tell you the same. I think that what makes Aleph Zero so special is the non compromising approach towards the quality of music we release and the attention to every small detail in producing our products. We could have already released 35 albums by now based on the amount of material we receive for consideration. But we tend to filter most of it and keep only those that we feel stand in our standards of musical production, those special tracks or artists that have a real musical story to tell, and stand out from the rest of the crowd in terms of freshness and musical creativity. Also we invest much more in the production and promotion of our artists and releases. 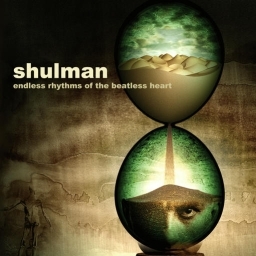 We are currently working on a Live Shulman album which will feature special live edits to familiar tracks. Hopefully it will be released in 8-10 months from now. Also a Shulman tour in Australia (3 shows) is planned in Christmas and New Year 2007. For more updates please join our mailing list on our website www.shulman.info. Thank you for the interview, last words? We want to thank all the fans and promoters who support us. It’s very much appreciated and keeps us going, so thank you from the bottom of our hearts! We hope people will enjoy “Endless Rhythms of the Beatless Heart” as much as we enjoyed working on it. Please check out our website: www.shulman.info, and our myspace page for more info, samples and downloads.